- Weaver style, fits TC Encore and Pro Hunter barrels. World famous for its toughness, the Keylock one-piece base is precision machined from solid aluminum billet (no cheapy play-doh factory extrusions). Take note that the top is full and flat... No useless sight groove to take away from strength and rigidity. This means the ring slots are full width for locking into rings with more surface area. The slots themselves are positioned for optimum strength and mounting convenience. Of course it fits the standard Thompson Center 4-hole mounting pattern. But we've designed it with the option for 6-Screw mounting... Giving the strongest possible TC Encore Scope base. 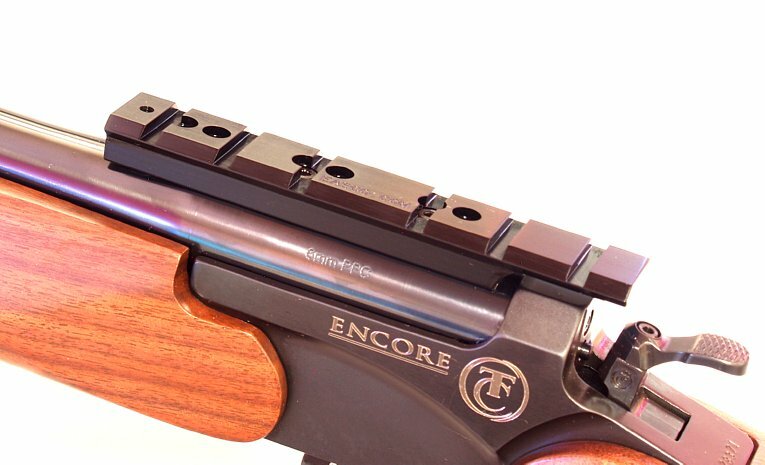 - Original EABCO KeyLock Magnum precision machined scope mounting base for the TC Encore and Pro Hunter. 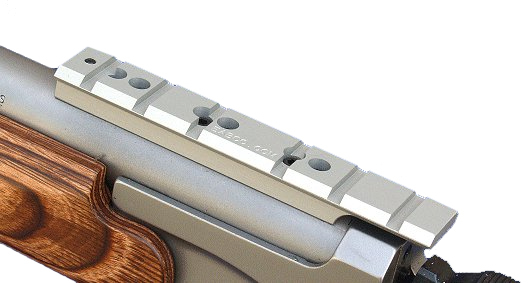 Mount it with the overhang to the rear to shorten the eye relief (Handgunners often mount it this way). Or, mount it with the overhang forward to get maximum eye relief (Rifle shooters prefer this). Mounts to the standard T/C 4-Hole pattern or can be mounted with 6 screws for maximum hold with the hardest kicking cartridges (requires 2 more holes drilled and tapped). Precision Machined from solid aircraft grade aluminum bar stock, this mount is designed to fit Weaver style rings. The design and the production method assures straightness, rigidity, snug ring-to-base fit and light weight. We recommend 3-Rings for magnum pistol configurations and 2-Rings for rifle configs. Straightness - Many scope bases are made from extrusions that can have inherent tendencies to curl like Play-Doh factories and Curly Fries. By precision machining our Keylock bases from solid bar stock, we can assure straightness. Rigidity - We machine our bases flat on top to give maximum thickness and full width slots. This insures maximum rigidity and full engagement of the recoil key on the bottom of the ring (It's why we call them "Keylock" scope mounting bases). Snug Fit - By machining everything in-house, we can assure maximum surface area and proper dimensions. This translates to a snug fit. Weaver style rings and base that fit snug are the most durable and accurate scope mounts in the world. I file a slot into the most rearward slot to accept a Williams Peep sight peep holder, then change the front sight on my Encore to a .450". Now all I have to do is use Q/R rings and I can use my scope or peep . Excellent product with expert installation. Thank you. Excellent job with perfect alignment of base. Additional 2 screws needed with recoil from my 460 S&W barrel. Great quality,greatly appreciated free install. It was nice to have this item already mounted on my new barrel when I received it. I recommend it.